One benefit of moving to a new city is the possibility of discovering new places and people on any given day. I’ve been discovering more places than people, but I want to show you what I discovered on our way to visit to the Owens-Thomas House. We got a late start and felt hungry so as we passed this little spot, we decided to stop and grab a sandwich. I don’t know if it would qualify for that T.V. show, Diners, Drive-ins and Dives, but Clary’s had a happy clientage and my grilled cheese on rye was perfect. I spotted this beautiful home on the walk back to the car, and had to drag dear husband away to discover what else this pretty street in Savannah had to offer. 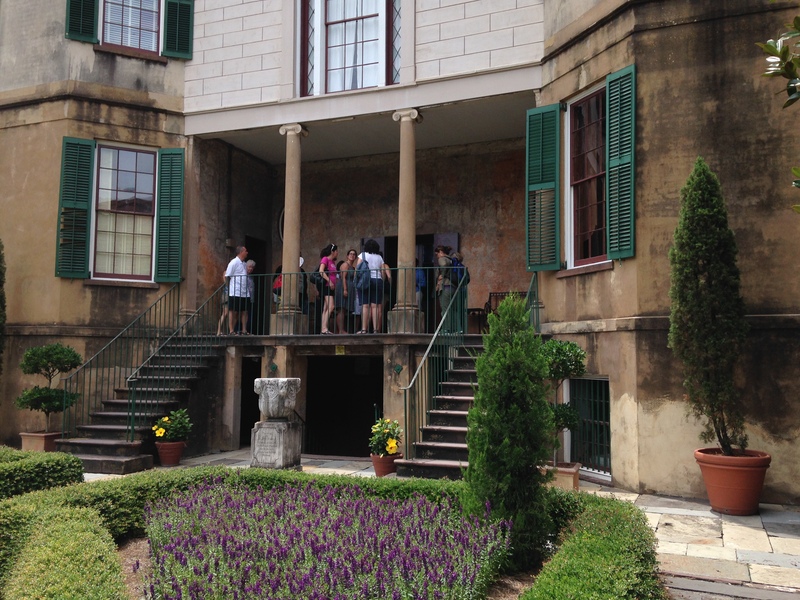 Many of the homes date to the Civil War era and you wonder who lived in these homes, and how they weathered the crisis and the desperate years leading up to Sherman’s march on Savannah. Fortunately there have been attempts to restore and protect the historic district over the many years and we are all the better for it. 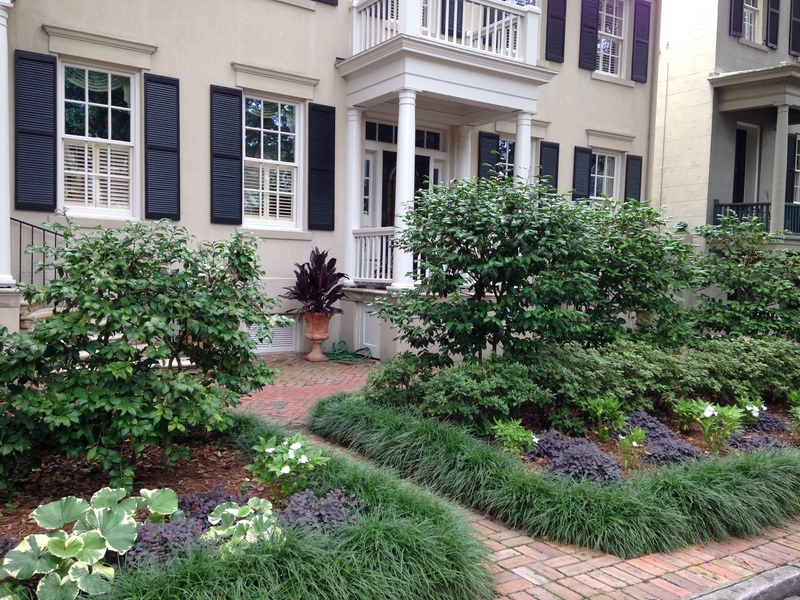 There are some very green thumbs living on this charming street off Abercorn. 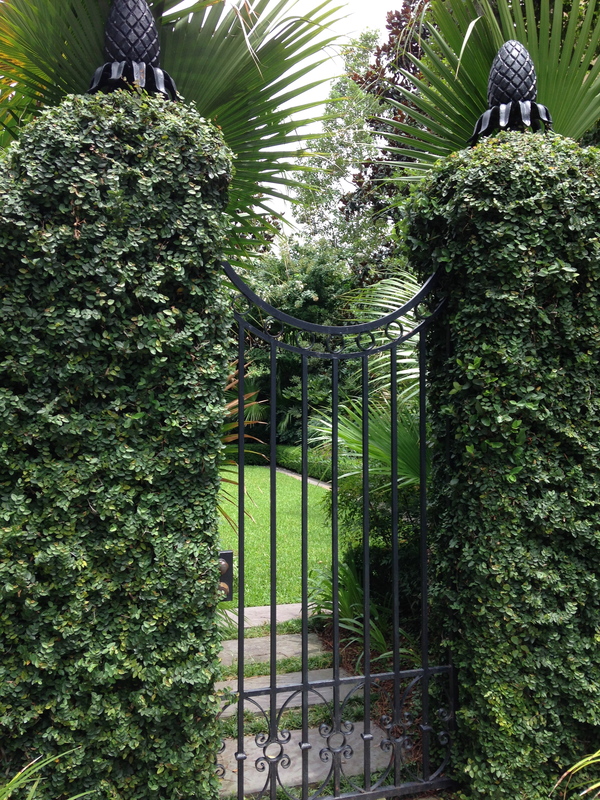 Like many cities, there are doorways, alleys and gates that offer glimpses to the city gardens. I will be curious to see what happens in this side yard! Though I live on the coastal side of Savannah where most of the building has been done in the last 40 years, I think that there should be references in your home to the history of the area. That is why I was wondering “what were they thinking?” when we bought our home and spotted this light pole right in the front yard. It is black iron, but…. We just had some fencing put up in the back yard so that we could sit outside with the dogs safely inside and the alligators hopefully far away in a lagoon on the other side! 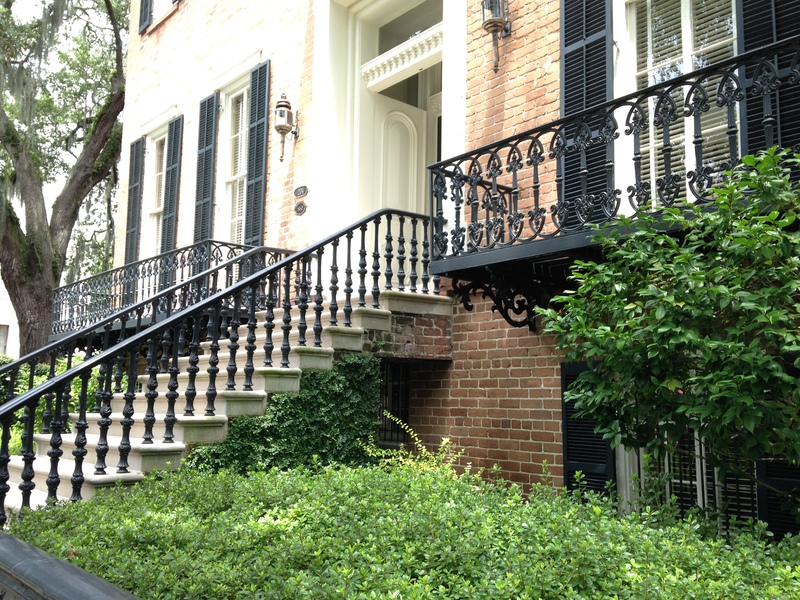 Of course, the iron work in historic Savannah is beautiful but it would not do on most new homes. Yet, I like the reference to the iron and it fits here much better than the white picket fence from our Connecticut home could have. 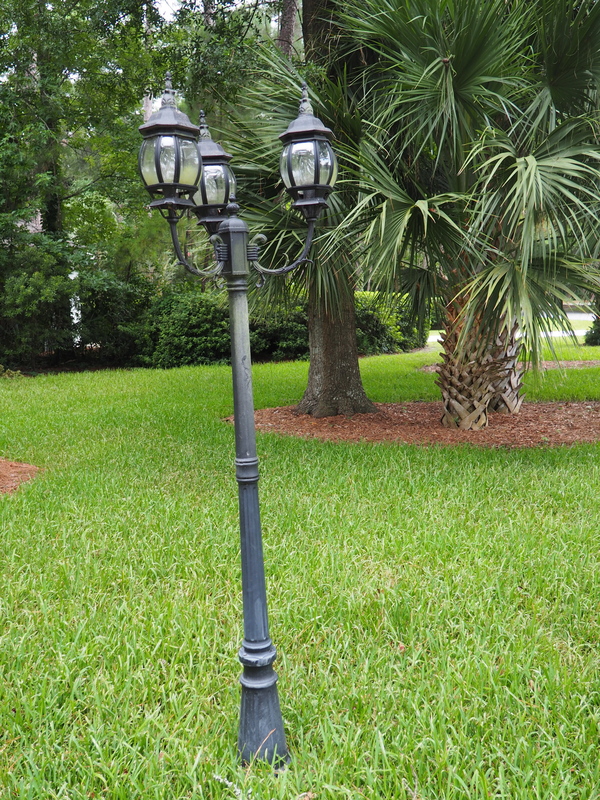 The light post may have a black wrought iron look, but there is so much else wrong with it – do you agree? And hopefully the fence for our back yard is right. This entry was posted in Uncategorized and tagged Clary's Savannah, historic Savannah architecture, Owens-Thomas House, Savannah homes, wrought iron work. Bookmark the permalink. 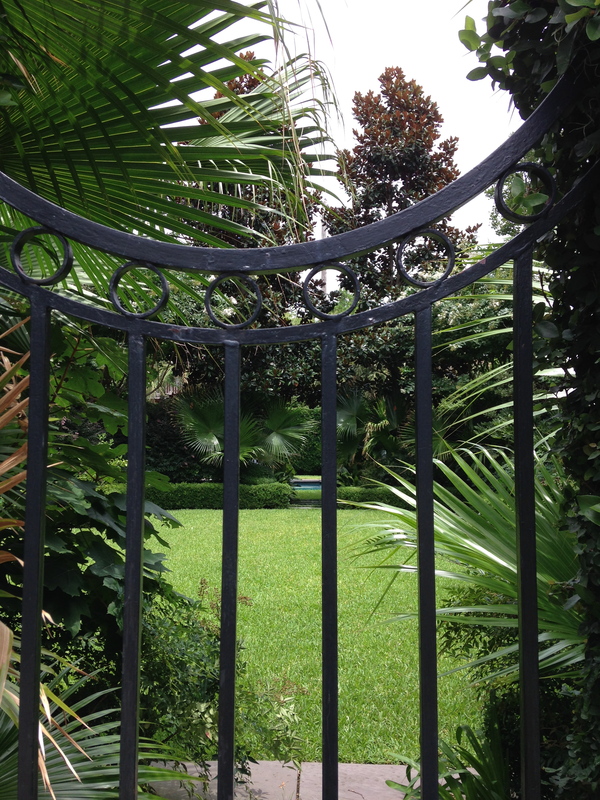 I love the Savannah side yards. 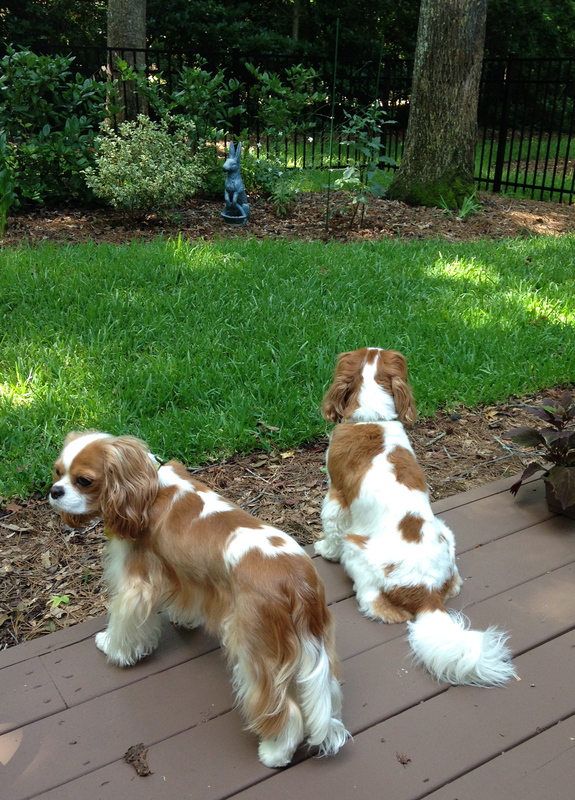 And your cavaliers are so cute, we have a tri color and he is such a lovey. Sweetest dogs I’ve ever lived with, and I had many dear labs, but the sweet factor is times two! Savannah and Charleston both are on my bucket list. I’ve heard that the architecture and history-rich regions are wonderful. I had to chuckle at your comment about the new fence and hoping that it keeps the alligators out. And I worry about coyotes. Your dogs are very cute. First, your dogs are totally adorable! What cuties! Second, looking at historical homes and envisioning the histories of them is fun. Third, when a city has enough rain and gardeners who care, its a treat to see their gardens when you are out and about on a walk! Savannah has some beauties! love love love your perspective and admire both your sens of adventure and More over your husband’s devotion to you! You are indeed a lucky lady! Yes, I hope the fence keeps the alligators out and your gorgeous dogs safely in! It’s always exciting exploring a new area with its gardens, you have some beauties there! It’s nice to see all the old details retained and preserved. It would be nearly impossible to replace them today, and sometimes the attempts just come off as cheap looking. Boston, California and Minneapolis! All so different and I imagine there were many adjustments to new places, but each place must offer new sights to fuel your creativity! Hi there and thank you for calling in! How beautiful are these homes…I see they are from the Civil War era. I know that there were some Civil War reproduction fabrics brought out. Wonder if your Sister got not some of them! Love he colours in them! Enjoy your new home and garden! Jayne, you’re reminding me why I’ve always wanted to visit Savannah! 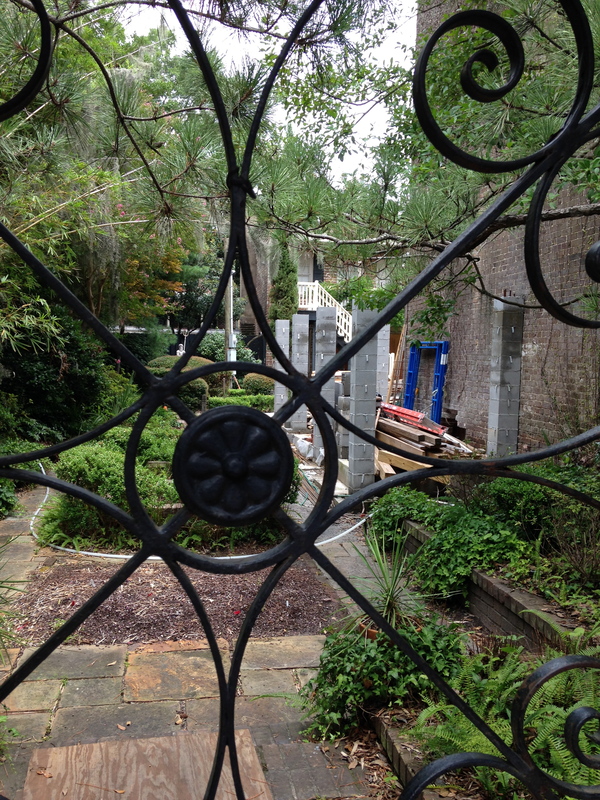 How romantic the gardens and home are with the brick + black wrought iron. Can’t wait to see more of your new home, and hear how your new life in the south is going! p.s. Thanks so much for stopping by my blog twice, not sure why comments weren’t working but so nice to read yours! Wow, everything looks very pretty there – would love to wander these streets too! And the lovely dogs! Hope you have a great weekend – enjoy it all! Great post. Makes me think I should visit Savannah a second time. Hi Jayne, I would fee; terribly nosy poking through gates and gaps in fences to see the gardens beyond, instead, I like to walk very slowly past the entrance drive, if it looks interesting then I may decide to accidentally drop something and make a fuss of picking it up all the while trying to inconspicuously get a good look.! I like your strategy! I hope that the owners are flattered by my enthusiastic snooping, but if not, I must apologize that my garden mania got the best of me! The light post is definitely out of place but it might have made sense to someone when it was installed – or not. They could have just been nutjobs. 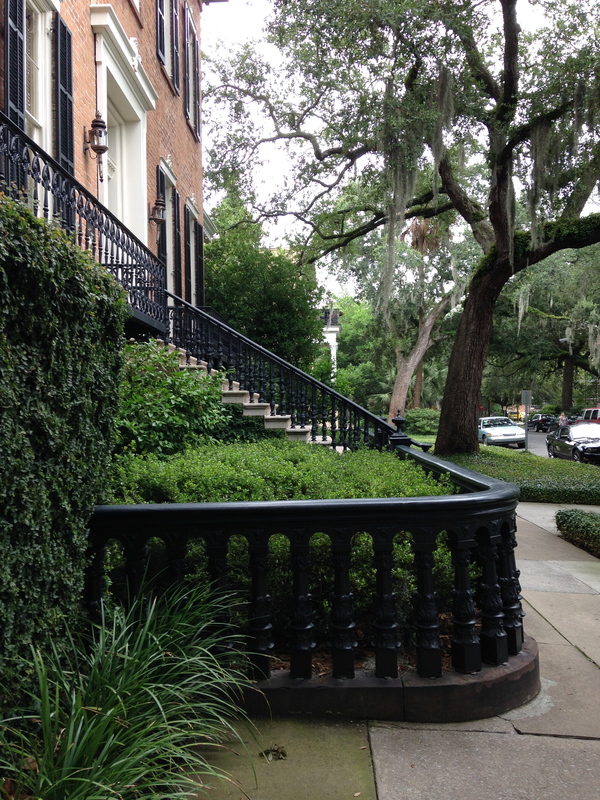 😉 I love Savannah and am always attracted to wrought iron. I like the little tucked away alley gardens. They feel so private.